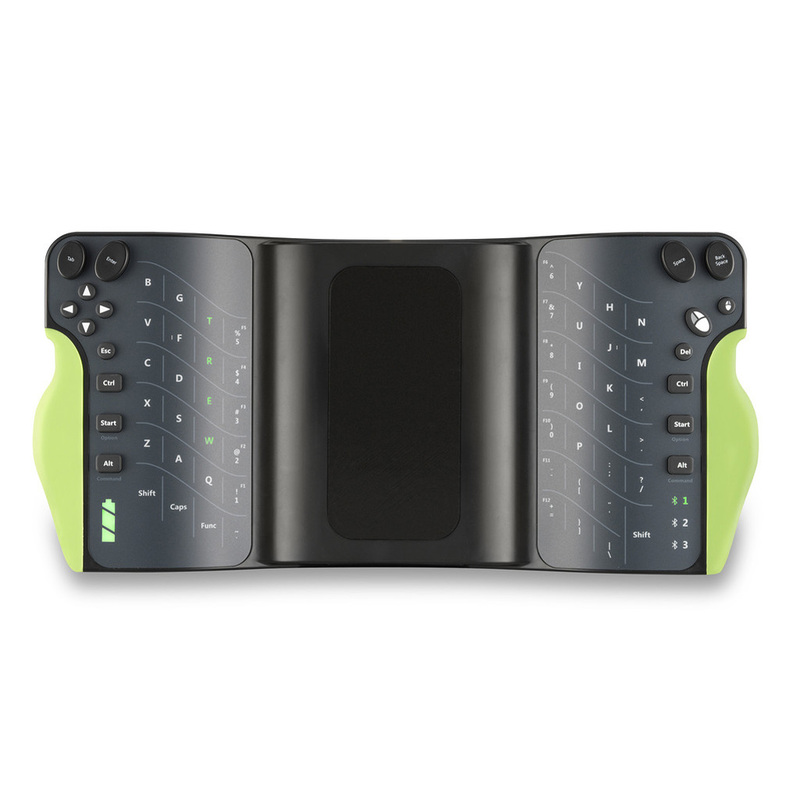 The TREWGrip Mobile Dock is a handheld, dual-mode keyboard/air mouse or keyboard/game controller that allows users to interact with mobile devices, smart TVs and VR/AR technology whether sitting, standing, or on the go. The two-sided device features TREWGrip's "Universal Dock" which, when combined with Bluetooth HID connectivity, allows users to turn any smart phone, phablet or mini-tablet into a mobile productivity tool. The back of the device provides a traditional QWERTY key layout, split and rotated to allow users to perform ten-finger text entry with the hands in a vertical, "palms in" position. The front offers navigation keys, modifier keys, and illuminated key actuation indicators. Mouse movement and game interactions can be controlled by simply tilting and turning the device. 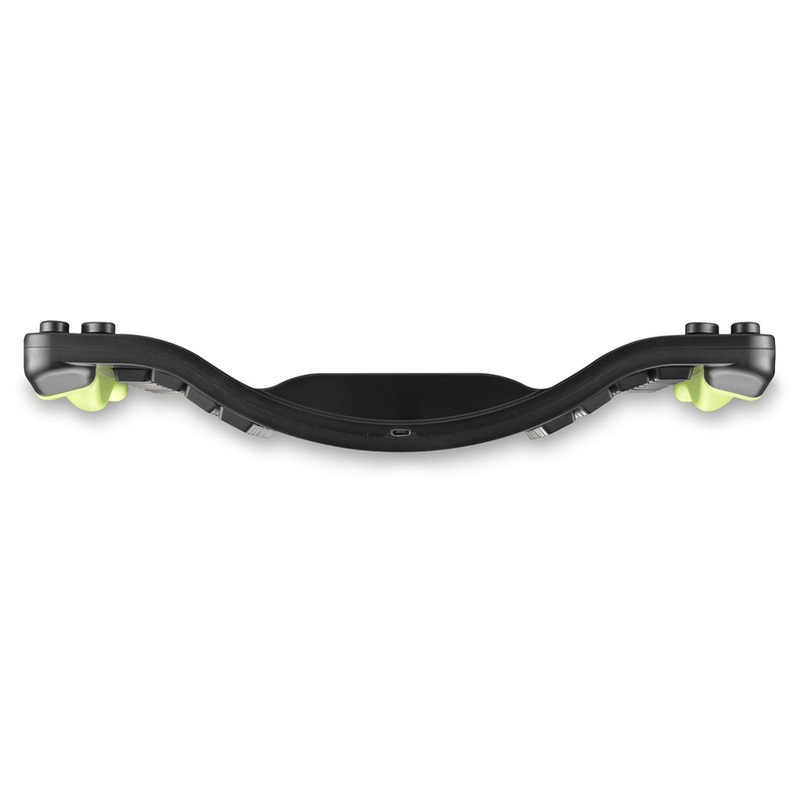 The TREWGrip Mobile Dock comes with comfortable handgrips, available in sizes large, medium or small. 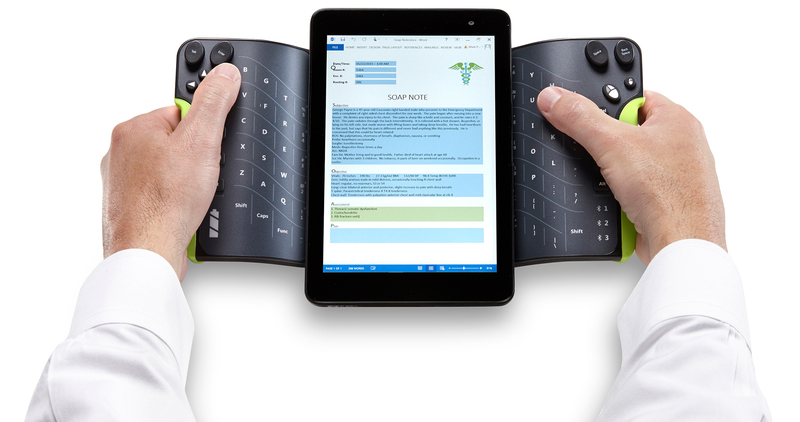 Prevents Pronation - The TREWGrip Mobile Dock allows users of mobile devices to avoid typing with the palms down and, instead, to experience the ergonomic benefits of maintaining the hands in the 'handshake' position. This position is known to reduce the risk of injury to the muscles and membranes of the hand, forearm and elbow. Learn More About Pronation. Reduces Risk of Thoracic Outlet Syndrome - Allows users to keep arms shoulder width apart when entering data into a mobile device. This posture helps users avoid discomfort and pain in the neck, chest, back and arms. Learn More About Thoracic Outlet Syndrome. 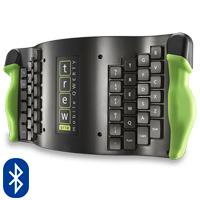 Eliminates Overreach - By combining a keyboard and mouse, or keyboard and game controller into one device, the TREWGrip Mobile Dock eliminates the need to reach for a separate input device. Facilitates Greater Activity - The TREWGrip Mobile Dock can be used by anyone while standing, and by touch typists while walking. This makes the device suitable for use on the go: whether at a sit-stand workstation, at a treadmill desk, or by those who take notes as they move from station to station in the workplace or in the field. 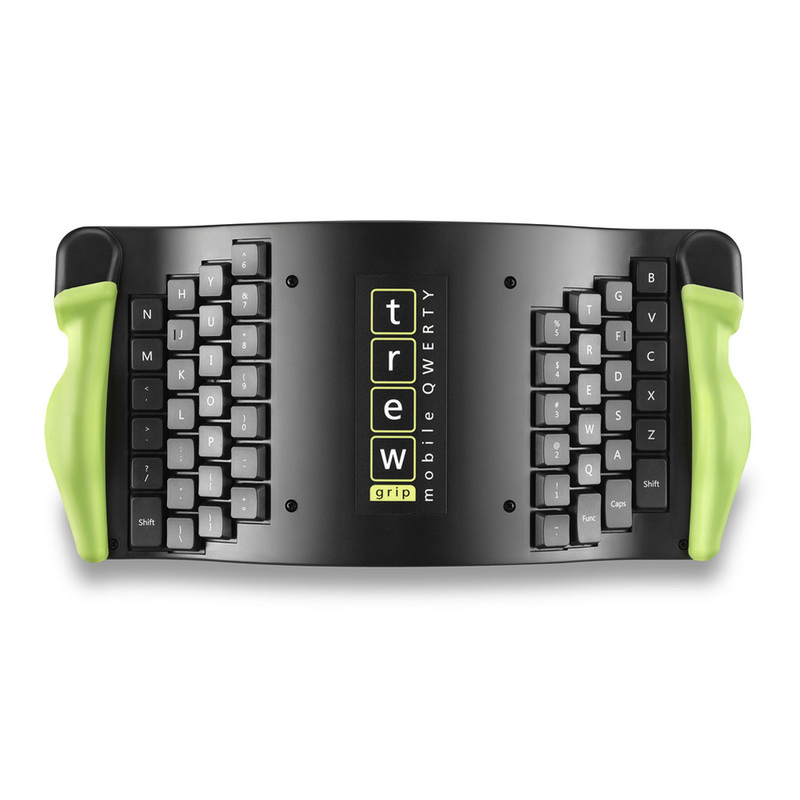 Two Operating Modes: The TREWGrip Mobile Dock can be toggled between keyboard/ mouse mode, and keyboard/game controller mode. Universal Mobile Dock: A suction/magnetic mount allows users to dock mobile devices up to 5.3" wide; two adhesive docking plates are included for attaching either a smart phone or a mini tablet. Bluetooth HID Connectivity: Allows up to three devices to be paired simultaneously to the TREWGrip Mobile Dock for instant switching between Windows, Android, Mac OS and iOS Bluetooth HID-enabled technology. Illuminated indicators show how many devices are connected. 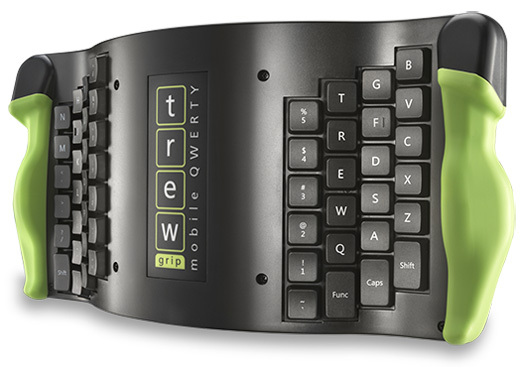 "Mobile QWERTY" Key Layout: Although the keys are separated and rotated, the TREWGrip Mobile Dock uses the familiar QWERTY layout found on traditional keyboards. Illuminated Indicator Keys: Legended indicators on the front of the keyboard (the side that faces the user) light up when a keystroke is actuated on the back. These visual cues help new users locate the correct key on the back, and help them adapt quickly to the vertical, 'palms in' typing position. Familiar Editing, Modifier and Navigation Keys: Space, Backspace and Enter keys, along with all the usual modifer keys and arrow keys, are on the front of the device and are easily accessible with the thumbs. The Start key, and the two Alt keys, are dual-legended as 'Option' and 'Command' keys for Mac users. Tactile Guides to Home Row: Small ridges on the F and J keys help users quickly locate the correct home row keys on the left and right sides of the keyboard. Tactile Keyswitches: Keyswitches provide the crisp, tactile feedback that is absent from the glass screen of a mobile device. Mouse Cursor Control: The TREWGrip Mobile Dock uses an accelerometer and gyroscope to control mouse movement. This can be configured for absolute movement by default, or for relative movement (required for Android devices and multiple monitors). Mouse Button: Left and right click functions are accessible on the front of the device, under the right thumb. Auto-Off Function: The device automatically powers off after ten minutes of inactivity. Handgrips in Three Sizes: Handgrips are available in sizes Large, Medium or Small to ensure a comfortable, efficient experience for all users. Choose the right size handgrips. If the handgrips are too small, you are likely to overshoot the keys you are targeting. If the handgrips are too large, you risk straining the fingers and hands as you reach for the keys towards the centre of the device. Take advantage of the training programs offered by the manufacturer. See the link under Additional Resources.